January is the best month to choose crops, order seeds, and plan your seed-starting and planting schedules. 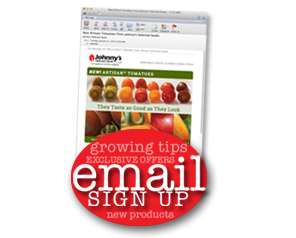 Spring is still months away, but you can start planting earlier than ever before with the new season extension products available from Johnny's. And by doing your planning this early, you can be sure you won't miss any important windows for valuable early crops. In this issue of the JSS Advantage, we'll tell you about some new tools and strategies to help with your planning as well as best practices for growing your own transplants. As a commercial grower, you know that production and marketing must go hand-in-hand. You want to grow crops only if you'll have a market for them at harvest time. And you want to start going to market only when you have sufficient volume to make it worth your time. Scheduling multiple crops for harvest on a target date can be complicated. That's why Johnny's in collaboration with Growing for Market has created a Target Harvest Date Calculator. Our calculator is available as a spreadsheet with the formulas embedded. You can download it as either an Excel or Numbers file. If you don't have either spreadsheet program, you can get the free version of Open Office, which can open the Excel file. You can also use it in Google documents, a free web-based set of applications with similar functionality as Office. To use the calculator, you first need to set a target date. For example, your target date might be the opening day of farmers market or your first CSA pickup. As the season advances, you might want to schedule multiple crops for a big event like a local food dinner or a wedding. And on the far end of the season, you want to be sure to bring in all your crops before your markets close for the year. After you've input your target date, you'll need to list the varieties you want to grow and input the days to maturity, which is listed in every variety description in the Johnny's catalog. You can figure in some other variables, and the spreadsheet will automatically calculate the planting date for each crop. If you sort the list according to planting date, you'll have a to-do list that you can transfer to your calendar. You will have to make a judgment about whether the recommended planting date is feasible in your climate. You may need to use row cover, a high tunnel, or a low tunnel to be able to plant early or late in the season. Once you have this information, you can determine how many crops you might have for your important date. The Seed Calculator figures the number of seeds or plants you need for a given amount of space. It is available in two options. The first option allows you to choose the vegetable you're planting and input the number of row feet you want to grow. The recommended plant spacing for each crop is already embedded in the calculator. In the second option, you have to input the spacing between plants yourself, which allows you to use the calculator for flowers, herbs, fruits, or unusual spacing of vegetable crops. The Seed-Starting Date Calculator figures the dates when it's safe to plant outside, based on the frost-free date that you specify. The Fall Planting Calculator. This calculator works backward from your first frost date to determine the date to start seeds for crops that will mature as it gets cold. Johnny's website is a great resource as you plan your season. Besides these calculators, you'll find a wealth of videos, how-to articles, and growers tips. Market growers start transplants in a wide range of facilities that run the gamut from climate-controlled greenhouses to unheated hoophouses to grow lights in the basement. Although a sophisticated greenhouse may be the ideal growing environment, many growers make do with much less during their start-up phase. Luckily, seeds don't care where they are started, as long as three conditions are provided: appropriate temperature, light or darkness, and moisture. Although most crops will germinate within a wide range of temperatures, germination is quickest at the optimum temperature shown in the graphs in the Johnny's catalog. For most vegetables, the optimum temperature is quite warm, 75-90˚F. This is the temperature of the growing medium, not the air temperature. Evaporation at the surface of the germinating medium can reduce the temperature 5-10 degrees below the air temperature. That's why heating mats or cables are recommended for seed starting. With bottom heat, the growing medium can be maintained at the optimum temperature. Some flowers have a particular requirement for either light or darkness during germination, and some germinate more completely or quicker in the preferred situation. Vegetables, in contrast, are mostly indifferent about light during germination. The instructions on the back of Johnny's seed packets tell you whether to cover the seed or not. If the seed packet advises leaving the seeds uncovered, a dusting of vermiculite on the seeds will help maintain moisture around them while allowing light through. Moisture is essential to all germination. The seed-starting medium must be thoroughly wetted before you plant, and you should cover the germinating flat with a plastic dome or piece of row cover to maintain humidity at the soil surface. However, the germinating medium needs to be well-drained, and the flats should be vented daily to prevent excessive moisture. If mold starts to develop on the soil surface, remove the cover. As soon as the seeds germinate, they should be exposed to light and removed from the heat mat. If growing them under lights, keep the lights just an inch or two above the seedlings and raise them as the plants grow. Leave the lights turned on 16 hours a day. Grow the plants at the recommended temperature on the seed packet. Seedlings get leggy and are susceptible to damage and disease if they are grown too warm or without enough light. The biggest threat to young seedlings is damping off, an ailment in which the stem withers right at soil level. It can be caused by several different fungi including Pythium and Rhizoctonia. Overwatering and overcrowding of seedlings are often contributing factors to the spread of the disease. It can be prevented by providing appropriate temperature, moisture, and air circulation. RootShield provides biological control and is OMRI-approved for organic production. Many growers start seeds in small containers to maximize the number of plants that can be grown on a heat mat or germination chamber. Johnny's 20-row seed flat is well-suited for this type of system because it uses a minimal amount of germinating medium and allows seeds to be separated by variety. After the seedlings have two sets of true leaves, they can be "pricked out" and transplanted into larger cells or plugs. Most growers keep three or four sizes of plug flats available to accommodate the needs of different crops and various field conditions. Tomatoes, melons, squash, cucumbers, and sunflowers are fast-growing plants with robust roots, so they should be grown in a larger cell, such as a 50-cell flat. Brassicas, onions, and many flowers can be grown in smaller cells, such as a 128-cell flat. Very small cells, like the 288 flat, can be used for plants that are going to be transplanted into a hoophouse, into smooth, well-prepared soil outside, or "bumped up" again into a larger container. This strategy of germinating in a small space then transplanting to larger containers also works with Johnny's soil block system. The Mini 20 Blocker makes 3/4" square blocks for germinating seeds. The Medium Blocker makes 2" square blocks and with the available insert, the blocks have an indentation that is just the right size for popping in a mini block. Germination mix is a fine-textured, soil-less medium with very few nutrients. It is designed primarily to be a well-drained medium for germinating seeds and keeping seedlings growing for a week or two at most. At that point, seedlings need to be transplanted into a medium with higher fertility, such as Johnny's 512 mix. Plants that stay in the greenhouse longer than four weeks may also need additional fertility such as provided by seaweed and fish fertilizers. 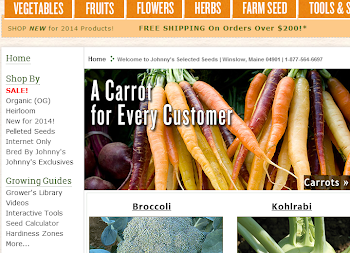 You can find everything you need for seed-starting on Johnny's website. Now through Feb. 28, 2011, you can save 10% on seed-starting supplies. Wow, These calculators are priceless. Your advise has inspired me to be more conscientious when planning and planting. I can potentially double my total harvest of some crops. Thank You! !